The reason that I was so enthusiastic about making the dulce de leche was that I had recently seen this recipe for a dulce de leche apple pie on The Cooking Photographer that looked so good. Caramel and apples go so well together and with the thought of a caramely dulce de leche apple pie there was no way that I could resist making it! With so many apples at the farmers market these days it was the perfect time to make the pie and I used a mixture of different types of those wonderful varieties of apples. This pie was pretty easy to make with you only needing to mix the apples, dulce de leche and a few other ingredients, assembling the pie and baking it. The hardest part is waiting for the pie to finish baking and then letting it cool while you are intoxicated with its heavenly aroma. The dulce de leche turned out amazingly well and it was very tempting to have seconds of dessert each night! The dulce de leche and apple flavour combination is just as good as the caramel and apple combo and I look forward to using this combo again! Of course I served the dulce de leche apple pie with a scoop of melting vanilla ice cream. That slice has my name on it! Yum. Sounds incredible. Homemade dulce de leche? Good grief, that sounds divine. Wow! This seriously looks out of this world! What kinds of apples did you use? There are almost too many kinds to chose from – I'm not sure what to pick. Thanks for the recipe! I find the additions of apple cider quite interesting……another great pie recipe!!! Oh my! I JUST made some cajeta today for the candy on my blog and I'm sure it would work great in this recipe instead of the dulce de leche! Thanks a ton Kevin! I'm pretty sure I would not be able to resist seconds! This looks amazing. This looks so pretty and so good. I love dulce de leche. I made a cheesecake for Thanksgiving using it. I had a similar pie this past weekend, but yours sound a lot better. Can I have one slice, please? Myust say that apple pie looks even more delicious with the dulche leche! Time to make apple pie, I'm thinking. Good Lord Kevin you kill me. My stars. Only found the essential addition of cornflour a couple of weeks ago – soaks up the juice from the apples as the pie cooks. I had no idea that dulce de leche was just condensed milk that had simmered for a long time! This sounds like a fantastic combination! I'm going to check out your dulce de leche recipe! yum! the apple pie looks fantastic! Great use of dulce de leche! Looks amazing! Yes, this would be the one to win over everybody! I've been craving apple pie… did you find the dulce de leche overly sweet? I like desserts, but don't usually like things that are REALLY really sweet. I imagine that the tartness of the apples would help to balance it? Allison Arevalo: I uses some spies and some honey crisp apples in this apple pie. meaghan: I did not find it overly sweet. You are right the the tart and juicy apples balanced the sweetness of the dulce de leche nicely. I LOVE apple pies. They are totally my favorite dessert. Kevin I didn't realize you made this pie! Thank-you! David Lebowitz makes dulce de leche in the oven – no scary boiling a can stove top for me. I cant wait to make this pie! my can of milk is almost done simmering and I'm preparing to make the pie. CAN'T WAIT! I will write again and let you know how it turns out. I LOVE caramel and apples – what a delicious looking pie! The dulce and pie are two of the most delicious foods I've ever made. Thank you! 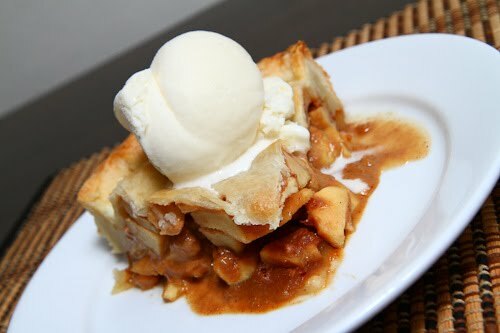 I've been looking for a recipe to use my dulce de leche in, and I LOVE apple pie… can't wait to try it! It looks great. MMMMMMMMmmmmmmmmmmm my mouth is watering. Kevin, Dulce de Leche alone would satisfy me. A great apple pie. This looks amazing! I'm more of a crust person, so I'm thinking of making a slab pie and using this as a filling. Thanks for the sharing! Here in buenos aires we eat apples with dollops of dulce de leche. Banana slices also. It´s an easy dessert that´s been around for ages. Should try banana cream pie with a layer of dulce de leche.. I made this pie a few weeks ago and we really liked it. I used the canned dulce de leche by Nestle and used the remaining stirred into my coffee and on some vanilla gelato. I used Cortland apples.